Did you know that there are a handful of instances in which a judge is much more likely to take a hard stance against an offense? Here on Oahu, one of those offenses is drunk driving. In other words, if you are arrested for drunk driving, it’s much more likely that your bail amount will be set particularly high. The judge will often consider a number of different things when setting a bail amount including criminal history, past bail skips, and more, but regardless of the situation, drunk drivers can usually expect the bail amount to be fairly high. The good news is that the team at Wanna Get Out Bail Bonds is here to help. If you get the call that a loved one has been arrested for drunk driving, there’s a good chance that you’re going to experience a wide range of emotions ranging from anger to frustration to relief. It’s natural to be upset that a person drove while intoxicated, it’s normal to be frustrated that he or she didn’t call you for a ride, and it’s a huge relief to find out that there were no injuries involved. At the end of the day, sometimes hearing that a person has been arrested can actually be the best thing to have happen because it can cause them to start to turn things around. One thing we want you to know is that no matter the time of day or night and no matter the specifics of the situation, we’ll be there to lend a helping hand at every step of the way. That’s why if you find yourself in the situation described above, today’s post is for you. Your natural impulse might be to panic, but the team at Wanna Get Out Bail Bonds is here to help you get out in front of the situation, taking care of you along the way. Keep reading to learn more! Perhaps you found us by searching for the term “DUI bail bonds.” We’re glad you’re here, and we’ll be sharing a bit of information that you’re sure to find helpful. The standard amount that Hawaii has set for a bond is 10% of the bail amount. In other words, if a judge happens to set the amount of bail at $50,000, you’d need to provide $5,000 to exit police custody, and we’d take care of the other $45,000. Unfortunately, many people find themselves in a position where they can’t make bail on their own. 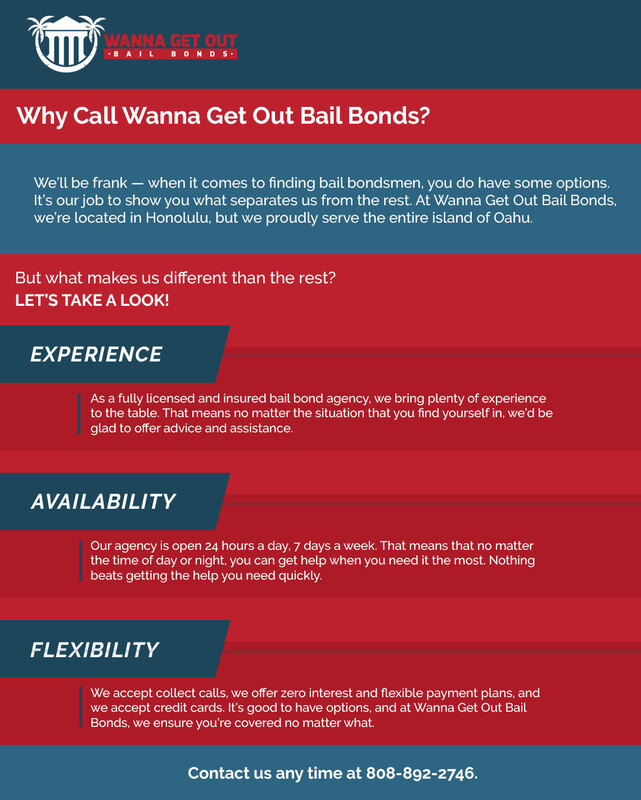 It can be a pretty dark place to find yourself, but at Wanna Get Out Bail Bonds on Oahu, we can often offer payment plans, and our surety bonds provide a perfect solution for a number of different people. At the end of the day, you have some choices to consider, but there’s probably going to be one that stands out as being better than the rest. Nevertheless, our team happily offers free bond advice to help you ensure that you make the right decision for your specific situation. We know that things are different for different people, and we’ll consider all of the facts and bring our expertise to the table to help make sure that you have all of the facts. Hey, why not set yourself up for success, right? As you well know, emergencies don’t happen on a schedule, and that’s often a big part of what makes them so stressful to deal with. When it comes right down to it, the truth is that the road ahead can be frustrating, but the good news is that we’ll be there for you at every step of the way. 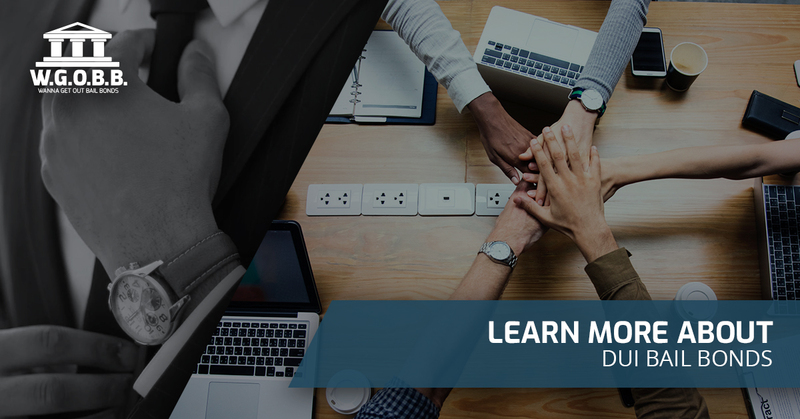 We have plenty of experience in the industry, and while we’re not lawyers, we can offer some insight into what you can expect and offer advice along the way. We’re proud to be able to offer 24-hr bail bonds for people because we know that they may need our help at different times. That’s why no matter the time of day or night, no matter the situation, we’ll be there to help. Contact us today, and put your trust in our team of bail bondsmen and bail bondswomen who have the experience you need on your side.